Are the new-look Cavaliers favorites to get to The Finals once again? Trade 1: The Cavs traded Channing Frye, Isaiah Thomas and their own 2018 first-round pick to the Lakers for Jordan Clarkson and Larry Nance Jr.
Trade 2: The Cavs acquired George Hill and Rodney Hood in a three-team trade, sending out Jae Crowder, Derrick Rose, Iman Shumpert, and a second round pick. Trade 3: The Cavs traded Dwyane Wade to Miami for a second round pick. The Cavs upgraded their talent and managed to keep the Brooklyn Nets' first round pick in this year's Draft. They did so by taking future salary off the Lakers' and Kings' books. Even if you disregard Hood's qualifying offer this summer and assume that they will waive Hill in 2019 (paying him just his $1 million guarantee for 2019-20, rather than his full $18 million salary), the Cavs took on an additional $15.5 million in salary next season and an additional $6.6 million in salary for the 2019-20 season. How those commitments are judged, of course, will depend on whether or not LeBron James re-signs with Cleveland this summer. James' status, of course, could be affected by how well the Cavs play over the next four months. And the players they acquired should certainly help them play better than they have over the last four. The Cavs have been most desperate for help on defense. They currently rank 29th in defensive efficiency, with multiple problems. Only two teams have allowed more points per game in the restricted area, only three teams have allowed their opponents to take a greater percentage of their shots from 3-point range, and only four teams have forced fewer turnovers per 100 possessions. In the 40 seasons since the league started counting turnovers, only one team (last season's Cavs) has reached The Finals after ranking in the bottom 10 in defensive efficiency in the regular season. The lowest ranked defensive team to win a championship was the 2000-01 Lakers, who ranked 19th. The Cavs probably aren't going to climb out of the top 10 between now and April 11. But they have to get better if they want to get back to The Finals. And a couple of their new additions can help. Hill (6-3) is six inches taller than Thomas (5-9) and Hood (6-8) is two inches taller than Crowder (6-6). The Boston Celtics' defensive improvement this season will tell you that size matters. The Celtics lost two guys - Crowder and Avery Bradley - with defensive reputations, but got bigger at all three perimeter positions, swapping Thomas, Bradley (6-2) and Crowder for Kyrie Irving (6-3), Jaylen Brown (6-7) and Jayson Tatum (6-8). The result has been the best defense in the league, one that has allowed 5.5 fewer points per 100 possessions than the Celtics did last season. The Cavs' added size in the backcourt should help in regard to forcing turnovers, running opponents off the 3-point line, and rebounding. Hill comes from another bottom-three defensive team, and the Kings were 5.6 points per 100 possessions worse defensively with Hill on the floor than they were with him on the floor, when they allowed 112.9 per 100. That is the fifth highest on-court DefRtg among 284 players who have averaged at least 15 minutes in 25 or more games. Two of the players with higher marks are new teammate J.R. Smith and former Cav Jae Crowder. But it's reasonable to disregard Hill's Sacramento tenure given how bad of a fit Hill was on, statistically, the worst team in the league. The Kings have a chance to become the first team to rank last in both offensive and defensive efficiency in a 30-team league in a full, 82-game season. Prior to this season, every team that Hill has played on (nine seasons in San Antonio, Indiana and Utah) has ranked in the top 11 in defensive efficiency. He was on two Pacers teams (2012-13 and '13-14) that ranked No. 1 on defense. Last season, the Jazz allowed just 100.2 points per 100 possessions in 684 minutes with Hill and Hood on the floor together. It helped that Rudy Gobert was on the floor for 587 (86 percent) of those minutes and the Hill-Hood combo was not adept at forcing turnovers (the Jazz forced only 12.3 per 100 possessions with them on the floor). But with Hill and Hood on the floor, Utah opponents took only 26 percent of their shots from 3-point range. That would have been the lowest opponent 3PA/FGA rate in the league last season. Defense from ... the Lakers? Both Nance and Clarkson come from a decent defensive team. After ranking last in defensive efficiency each of the last two seasons, the Lakers ranked 11th prior to Thursday's trades and allowed just 100.4 points per 100 possessions in 475 minutes with Clarkson an Nance on the floor together. That's not a ton of minutes and the pair generally played against the opponent's reserves, but that mark is lower than that of any Cleveland combo that has played at least 300 minutes. Nance does not rank well as a rim protector. Opponents have shot 68 percent at the rim when he's been there to protect it, the 10th highest mark among 88 players who have defended at last three shots at the rim per game. But he ranks in the top 50 in deflections per game and the Lakers forced 16.8 turnovers per 100 possessions (a rate which would lead the league) with him on the floor. If you're going to play alongside James, it helps if you can shoot off the catch. 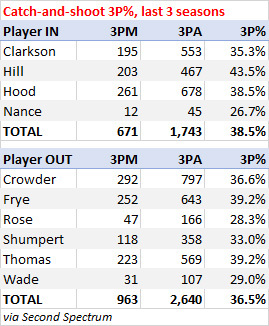 And, cumulatively, the players that the Cavs acquired on Thursday have shot better off the catch over the last three seasons than the players they traded away. The six players the Cavs traded were particularly bad on catch-and-shoot threes this season, making just 114 (31 percent) of their 364 attempts. Obviously, Nance isn't a shooter, but in regard to both his size on defense and his ability to knock down threes off the catch, Hill looks like the most valuable addition of the new guys. But the loss of Frye shouldn't be overlooked. Though he didn't play much in The Finals the last two seasons (Tyronn Lue didn't like the matchup against Golden State), Frye was a problem for some of Cleveland's Eastern Conference opponents. 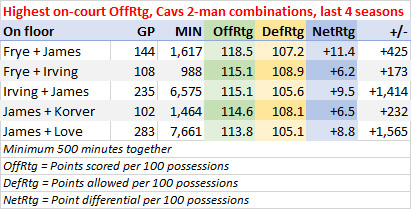 And in the four seasons since James returned to Cleveland, the Cavs' offense has been at its best, scoring 118 points per 100 possessions, with Frye and James on the floor together. Frye's Combo of size & shooting (with a quick release) made him a matchup problem with a passer like James. The Toronto Raptors, against whom Frye shot 23-for-38 (61 percent) from 3-point range over the last two postseasons, are probably glad he's no longer in Cleveland. The trade:The Magic traded Elfrid Payton to Phoenix for a second round pick. With just 28 games left on his rookie contract, the Orlando Magic finally gave up on Payton, whom they took with the 10th pick in the 2014 Draft. Payton has shot a career-best 52 percent from the field this season, but that number needs some context. Payton has taken only 26 percent of his shots from outside the paint. That is the second lowest rate (higher than that of only Ben Simmons) among 125 guards who have taken at least 200 shots from the field. Payton has improved his ability to finish at the rim in his four seasons. After shooting just 49 percent in the restricted area as a rookie, he shot 58 percent there over his second and third seasons and 67 percent in the restricted area this season. But as a guard who doesn't shoot much from the outside (maybe because his hair is in his field of vision), Payton isn't a huge threat offensively. And on the other end of the floor, Payton has been a liability. The Magic allowed 113.6 points per 100 possessions with him on the floor. That is the highest on-court DefRtg among 284 players who have averaged at least 15 minutes in 25 or more games and 9.4 points per 100 possessions more than the Magic allowed with Payton on the bench. The Magic have allowed 49.6 points in the paint per game, more than any team in the last 20 years. And they allowed 52.5 per 48 minutes with Payton on the floor. The trade: In a three-team deal, the Nuggets acquired Devin Harris and a second round pick, the Knicks acquired Emmanuel Mudiay, and the Mavs acquired Doug McDermott and a second round pick. The Nuggets are currently in seventh in the East, but tied in the loss column with the ninth-place Clippers. And they were desperate for a back-up point guard, because Mudiay's minutes have generally been a disaster. The Nuggets were 12.7 points per 100 possessions worse with Mudiay on the floor (minus-8.6) than they were with him off the floor (plus-4.1). He did have some better minutes (plus-3.1 per 100) since returning to the rotation a few weeks ago and he has shot better from the outside this season (effective field goal percentage of 48 percent from outside the paint) than he did in his first two seasons (40 percent). But Mudiay has remained one of the league's worst finishers in the rim (only three players have shot worse on at least 100 shots in the restricted area) and his overall effective field goal percentage of 46.0 percent is still well below the league average (52.1 percent). Harris has generally given the Mavs a good lift off the bench this season. In fact, the Mavs were 13.5 points per 100 possessions better with Harris on the floor than they were with him off the floor. The Nuggets swapped the guy with the sixth worst on-off NetRtg differential (Mudiay) among 304 players who have played at least 500 minutes this season for the guy with eighth best on-off NetRtg differential (Harris) among that same group. Harris' differential is as much about the Dallas starters, who have been consistently overmatched against the starting groups of their opponents, than it is about Harris. But the Mavs stayed in games (only two teams have had more games within five points in the last five minutes), because the Mavs had one of the best bench units in the league. In fact, the Mavs' lineup of Harris, J.J. Barea, Yogi Ferrell, Dirk Nowitzki and Dwight Powell outscored its opponents by 19.4 points per 100 possessions, the third best mark among 30 lineups that have played at least 200 minutes together. Long live the super-fun, Dirk-plus-bench unit. Trade 1:The Heat acquired Dwyane Wade from Cleveland for a second round pick. Trade 2:The Heat acquired Luke Babbitt from Atlanta for Okaro White. The Heat, dealing with a slew of injuries, needed depth and offense. And they added both by bringing back two guys they've had before. Wade isn't the most efficient scorer in the league. His effective field goal percentage and true shooting percentage are well below the league average. He has taken just 50 percent of his shots from the restricted area (where he's still a good finisher) or 3-point range (where he's still pretty bad). He has attempted twice as many mid-range shots as 3-pointers. But he does give the league's 24th-ranked offense another ball-handler. Babbitt gives them another shooter. 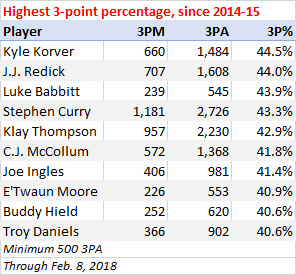 He has shot 44 percent from 3-point range over the last four seasons, the third best mark among players who have attempted at least 500 threes in that time. The Hawks are at the bottom of the Eastern Conference standings, but for a short time, they had a decent starting lineup (plus-3.1 points per 100 possessions) with Babbitt and Dewayne Dedmon on the frontline. The trade:The Knicks traded Willy Hernangomez to the Hornets for Johnny O'Bryant and two second round picks. Hernangomez led all rookies with 11 double-doubles. He grabbed 39.8 percent of his team's rebounds while he was on the floor, the highest rate among rookies who played at least 500 minutes. And his effective field goal percentage of 53.3 percent was the best mark among 24 rookies who attempted at least 250 shots. Hernangomez ranked sixth in offensive rebounding percentage among 294 players who averaged at least 15 minutes in 40 or more games last season, grabbing 14.2 percent of available offensive boards while he was on the floor. On the other end of the floor, Hernangomez was, statistically, the worst layup deterrent in the league. With him on the floor, Knicks opponents took 38.2 percent of their shots in the restricted area, the highest rate among the 256 players who were on the floor for at least 2,000 opponent shots last season. Charlotte leads the league in defensive rebounding percentage and ranks ninth in second chance points per game, so Hernangomez doesn't necessarily fit a need. And the Hornets just got Cody Zeller back from a two-month absence, so it's not clear that there's any immediate playing time available for the new acquisition. But Hernangomez is on a cheap contract for two more seasons beyond this one and with some work, Steve Clifford may be able to turn him into a not-so-terrible defender. The trade:The Bucks acquired Tyler Zeller From Brooklyn for Rashad Vaughn and a second round pick. The Nets' most-used lineup, with Zeller at center, was a plus-6.5 points per 100 possessions and pretty strong defensively. The Nets grabbed 79.9 percent of available defensive rebounds, a rate which would rate fourth in the league, with Zeller on the floor. The Bucks have seen the league's biggest drop-off in aggregate bench NetRtg, from plus-2.1 per 100 possessions (eighth in the league) last season to minus-4.8 (24th) this season. The Grizzlies clearly couldn't get a first round pick for Tyreke Evans, who they shut down last week in anticipation of a trade. Rather than taking the best offer (likely two second rounders), they decided to hold onto Evans, who they might be able to re-sign in the summer. We'll have to wait until July to see if Evans shows some loyalty to the team that helped him resurrect his career. The question for now is whether Evans goes back to playing 30 minutes a game for the Grizz, who are one of eight teams at the bottom of the combined standings with 17-19 wins. Lottery odds for seven of those eight teams (and the Cavs, who own the Nets' pick) will change with their results over the last two months of the season. The Grizzlies have the most road-heavy schedule of those eight teams, but have also been 10 points per 100 possessions better with Evans on the floor than they've been with him on the bench. It's really been a remarkable comeback for Evans, who was an inconsequential element of the DeMarcus Cousins trade a year ago. While registering a career-high usage rate of 28.3 percent this season, he has career-high marks in assist-turnover ratio, effective field goal percentage and true shooting percentage. And he has shot 40.4 percent on pull-up 3-pointers, the second best mark among 17 players who have attempted at least three pull-up threes in 25 games or more. His status for the rest of the season will affect the Grizzlies win total. The Pistons are 4-0 with Blake Griffin, who was acquired in the blockbuster deal that took place 10 days before the deadline, and they've allowed less than a point per possession over the four games. Some context... First, the Pistons have had a rest advantage, with their opponent playing the second game of a back-to-back, in all four games. Second, all four opponents have been below-average offensive teams and three of the four rank in the bottom seven offensively. They have two pre-break games against the 22nd-ranked Hawks (the second of which is another rest-advantage game), but will host the 11th-ranked Clippers on Friday and the seventh-ranked Pelicans on Monday. Overall, the Pistons have one of the league's easiest remaining schedules. Even with the schedule advantages, it's worth noting that the Pistons have outscored their opponents by more than 24 points per 100 possessions in 84 minutes with Griffin and Andre Drummond on the floor together. Over the four games, Griffin has assisted Drummond on nine of the 21 baskets that the center has scored with Griffin on the floor. Griffin has also been complemented well by third big Anthony Tolliver, though Griffin himself has shot just 39 percent with Drummond off the floor.